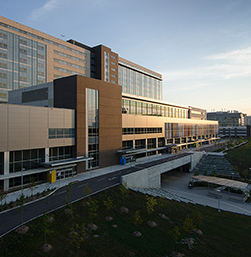 The new Humber River Regional Hospital. When the Church Street campus of the Humber River Regional Hospital closed, the community had mixed feelings. On the one hand, the Hospital had since 2007, transformed itself from the second most dangerous hospital in the country into one that was within acceptable limits. On the other, although the neighbourhood facility was a community asset, a brand new facility promised to improve patient care using state of the art equipment and communications. Traces of blood, urine and other bodily fluids can be found throughout the hospital, usually on the floor. Rodents have been observed in the hospital. Feces, urine and other bodily fluids can’t be cleaned properly because the (hospital issued) micro-fibre mops aren’t made to wash certain surfaces. Right from a sci-fi novel, another of the complaints refers to robots having first dibs on the elevators. The full list is here. The union is engaged in a bit of a death struggle with the hospital which has begun contracting out cleaning to a company that pays about half of what hospital cleaners make. Let’s hope the obsession with cost cutting won’t lead to safety or quality of care issues for patients and staff. Read more in this Toronto Star article. Not sure what that has to do with anything Bob. Dr. Rueben Devlin is the CEO of HRH and he is as conservative as they come. He used to be the Conservative Party President. And he also ran Church site so he is very much to blame for all the trouble with the old site and the new. He is retiring in the summer and good riddance! Good to know, and horrifying that the new place is as grubby as the Church St. hospital was. Previous Previous post: How much is the UPX losing? $122,000 a day.